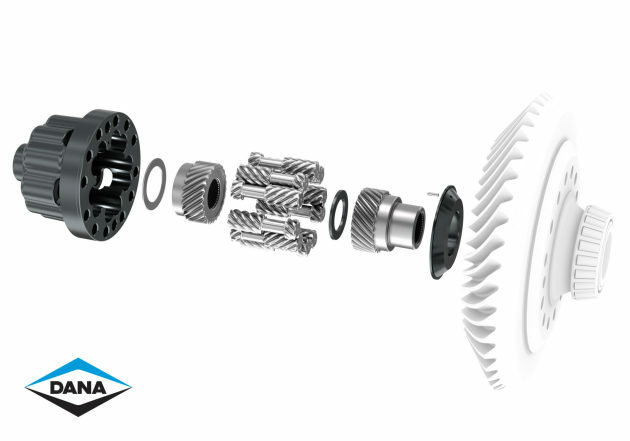 ATLANTA, Ga. – A new Spicer Dura-Tune center bearing for downsped drivetrains, and a Spicer Trac-Lok limited slip differential for medium-duty trucks were introduced by Dana at the Technology & Maintenance Council’s spring meetings. The Spicer Dura-Tune center bearing, available on Spicer SPL driveshafts and heavy-duty Spicer 10-Series driveshafts, is designed to isolate and dampen vibration in downsped applications. It also reduces noise and harshness levels associated with the higher drivetrain torque stresses and vibration frequencies created be engine downspeeding and chassis lightweighting. 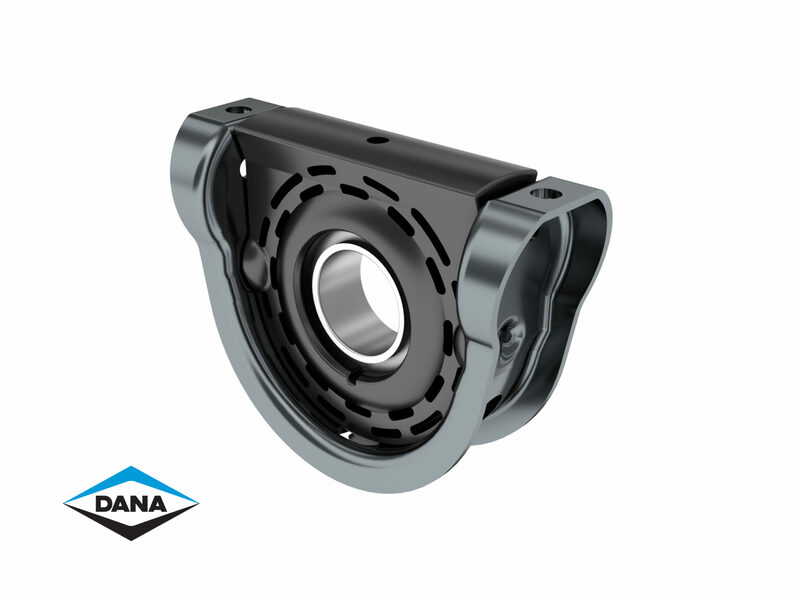 The Dura-Tune can replace the current standard SPL and heavy-duty Spicer 10-Series center bearing assemblies, as well as competitive products, Dana announced. It was designed in collaboration with OEM partners, to ensure it meets the needs of the market going forward, Slesinski said. “This was designed to ensure operates properly in those new lighter-weight vehicles,” he added. The Spicer Trac-Lok limited slip differential is designed for S140 single drive axles, which will be available in June for medium-duty trucks. Dana said it provides improved traction during unexpected wheel-slip events. No switches, wires, sensors, air hoses or manual driver input are required, Dana announced. During a slip event, it automatically sends about three times more torque to the high-traction wheel-end. It then returns to normal wheel-end differentiation as conditions change, to provide maximum vehicle handling. “This new differential can be retrofit in existing vehicles that are out there,” Slesinski said. 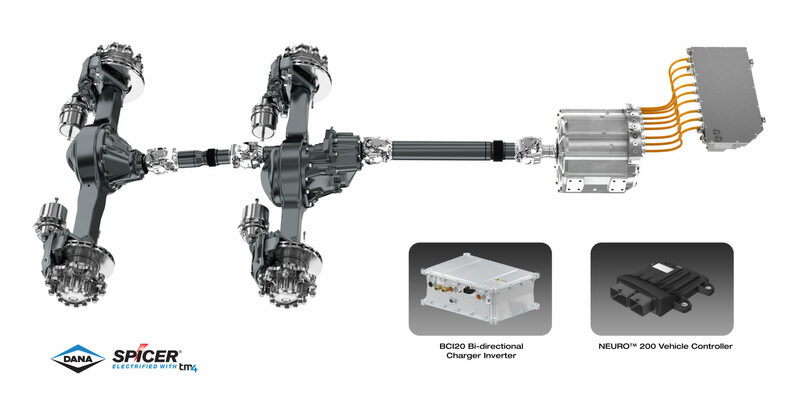 Dana also announced it has been selected by Lion Electric Company to supply production-ready electrified technologies and traditional drivetrain systems. The Lion 8 Class 8 truck will use Dana’s TM4 direct drive system and traditional driveline components. Dana’s contribution to the Lion 8 electrified system.